Is it good to give your panels a regular clean? How much money will it cost me to have my solar panels cleaned? Why pay so much money for a solar system if you are not going to assist it in working to it’s full potential? Yes. We believe to keep your system at optimum performance it is paramount to have reguarly scheduled a solar panel cleaning service. Whether this cleaning is performed by yourself, or a professional, your system will only perform better once this has been done. Reguarly doing this, is the best way to ensure your system cranks out the kw/hrs, doing it’s job, saving and making you the most money it possibly can. solar panel cleaning in brisbane. Look at the results! If you must do it yourself, remember that you will be walking on a wet roof, Sometimes dangerously hot. When we Install solar panels, we need to use harnesses for a reason remember. 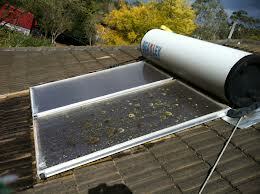 Expect to pay around $100 for a full clean on a 5kw system and a 1.5kw system, being $50 to $60. With an expected 20% increase of performance, solar panel cleaning ensures those numbers are sure to add up and make sense. Look at all the leaves on this solar panel. This not only affects the one panel, but every panel in that string of panels. Get this stuff cleaned ASAP! We have all different ways and measures to suitably clean your home or businesses, solar panels. There is no point. Customers and our installers/electricians worry so much about whirly bird or TV antenna shading on the roof. However, we need people to understand that salt residue, bird droppings, leaves and all sorts of grime are detrimental to your solar power system’s performance. Please CLICK HERE and let us know you are after a free quote for solar power cleaning in the additional comments. We have all the latest technology and techniques in solar panel cleaning in Brisbane and the Gold Coast. Interested in having you clean my clients panels. Is there a price list? Is there any other maintenance you do to the system? When cleaning our Electricians will check out and see how the existing system install is fairing, and assess the safety and reliability of it. Do you quote/clean on the gold coast.